I’ve decided to try a new feature around here that I think you’ll enjoy. I find so many awesome resources online all the time that I want to share, so each month I’ll be posting a different topic with links to ten great online resources pertaining to that topic. If you have another link to share, feel free to add it in the comments so we can all learn something new. 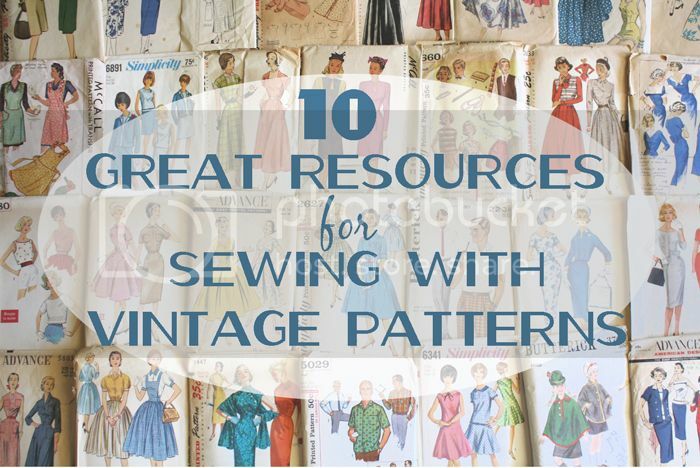 The first topic is one near and dear to my heart- sewing with vintage patterns! 1. For a concise and helpful overview, start here for Casey’s introduction to using vintage patterns. 2. The definitive database on vintage patterns, you can check out the Vintage Patterns Wiki to find out more information on a pattern you own, like the year it was printed, what it looks like made up (if someone else has made it), upload your own pictures, or even where a certain pattern is for sale on the web. 3. Have a vintage pattern that you’re dying to sew but it isn’t exactly your size? Check out Casey’s three-part post on grading vintage patterns (Part 1, Part 2, Part 3) and make it anyway! 4. Older patterns don’t always come to us in the best condition, but luckily this post on Sew Craftful shows how to properly repair rips and tears in vintage sewing patterns. 5. Ever come across a pattern that has no markings printed on it at all? They’re more common in the older (1940s and earlier) patterns and can be really tricky to figure out. 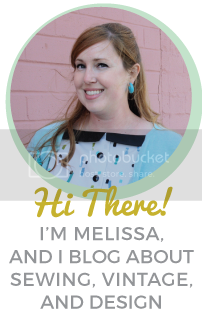 I’m so happy that Rochelle of Lucky Lucille wrote a very helpful post about working with unprinted vintage patterns. 6. One of the biggest no-nos with vintage patterns is ignoring the measurements on the pattern envelope. Your size in a vintage pattern will most likely be very different from your modern ready-to-wear garment size (or even your size with modern sewing patterns). This post on Sew Mama Sew shows you how to take your measurements the right way to ensure you’re choosing the correct size. 7. Another excellent overview from Threads magazine on vintage sewing patterns- it goes into depth on different eras and styles and even gives you instructions for some vintage sewing techniques that might be called for by the pattern instructions. 8. For all of you sewing newbies, Mena from The Sew Weekly wrote an encouraging post on Sew Mama Sew about why you should try out vintage patterns, even if you’re a beginner. Don’t be afraid to dive in! 9. Gertie has a great post about vintage pattern sizing- including how to choose which size to make, where you’ll probably need to make adjustments, etc. 10. Where to find vintage patterns? Of course, Ebay and Etsy are the big ones, but there are many online shops that sell vintage patterns. Here are a few: Mom’s Patterns, Rusty Zipper, Vintagesewingpatterns.com, and the Vintage Pattern Marketplace (a hub for many different shops). I’ve also found patterns at thrift stores, estate sales, yard sales, flea markets, and antique shops for great prices (usually much cheaper than online). Check often and keep your eyes open! I hope this was helpful to some of you! Please feel free to leave any other relevant links in the comments!